The Saab J 21 is a peculiar airplane, not only because of its advanced features. This fighter in particular is the only airplane that was initially powered with a piston-propelled engine, then later modified to incorporate a jet engine using the same airframe and implementing very few modifications. This airplane is also the product of Swedish defence concerns and resourcefulness, as Sweden wanted to keep its neutrality and territorial integrity during WWII, electing to develop a domestic fighter program as access to foreign advanced technology was restricted. A single-seat, single-engine airplane that later became one of the first-generation jet fighters. Its design is a twin-boom tail pusher configuration. It had two longitudinal booms, attached to the main wing but extending backwards from the middle section of each wing, with the main body placed in the middle. Similar to the Lockheed P-38. This design also implements a rear mounted piston engine, otherwise known as a pusher configuration, which made engine modifications easy. The piston-propelled version, the J 21 – had the engine, a licensed Daimler-Benz DB 605B, simply fitted at the rear of the main body, behind the cockpit and between the longitudinal booms. The jet version – J 21R – was fitted with air in-takes at both sides of the fuselage, having the engine (a De Havilland Goblin 2 and later a Swedish-licensed version, a Flygmotor RM1) located on the same area as the piston-propelled version and elongating the main body. The fuselage section harbouring the engine was also widened. Another modification was that the elevator was placed at the upper area of the double tail plane. The wing in both configurations was a low-wing, being straight until it met the longitudinal booms, changing into a slightly swept wing from the longitudinal boom to the wing tip. It also received wingtip fuel tanks. The J 21 could develop speeds up to 645 km/h (400,78 mph), while the jet propelled version could develop speeds up to 800 km/h (497 mph), being a fast aircraft in both configurations. Its firepower (J 21) was equally powerful, as it was armed with a 20 mm cannon, either a Bofors or a Hispano-Suiza HS.404, and 2X 13,2mm Bofors machineguns at the nose, with 2X 13,2mm Bofors machineguns in the wings. The J 21R received an even much more considerable firepower, as it featured a 20mm Bofors cannon, 4X 13.2mm M/39A heavy machine guns, a centreline pod with 8X 13.2mm M/39 machineguns, and wing racks for 10X 100mm, 5X 180mm, or 10X 80mm anti-armour rockets. The J 21 was initially developed with the aim of providing Sweden with good air assets to defend its air space and neutrality, and also with the aim of replacing many of the existing airplanes development. The development began in 1939, under the lead of Frid Wänström, having as basis a Bristol Taurus as an engine, yet it fell into a momentary freeze until 1941, when it was resumed. This freeze was due to Saab’s concentration in the Saab B 17 and B 18 bombers. As the configuration resulted problematic for the pilot’s safety when bailing out, many proposed solutions came, such as blowing the propeller, blowing the entire engine or using a “bomb crutch” to throw the pilot away from the airframe. The solution came with the development and implementation of a Bofors ejection seat, which was tested first on ground and in-flight on a SAAB B 17. The nose landing gear wheel was tested on a steel platform attaching the three undercarriage components, with the structure being towed by a truck during the test programme. In 1943 the first flight of the prototype took place, with units entering in service with the Flygvapnet in 1945. Three prototypes were built during the development process. In 1947 the J 21 evolved into de J 21R when it received the De Havilland Goblin jet engine, but as the J 29 Tunnan was introduced, it replaced the J 21 as the main fighter, performing the J 21 instead ground attack missions, thus designated A 21R. The J 21 was in service with the Flygvapnet from 1945 until 1954, with 298 fighters built from 1945 to 1949. The J 21R was in service with the Flygvapnet from 1950 until 1956, with 60 units built from 1950 to 1952. Three J 21 are preserved as static displays in museums. The basic design of the J 21/J 21R was a twin-boom tail pusher propeller, making it one of the most radical operational designs of those times. This scheme proved to be beneficial for two important aspects. First, it benefited both pilot view forward and allowed the armament to be concentrated on the nose, meaning that such combination provided a good firing scope and sight, let alone a good firepower and making maintenance services rather easy. Second, it made possible for the aircraft to be updated thus being able to install a jet engine using the same airframe of the piston-propeller engine version, which was basically the basic airframe. The only drawback of this layout – mainly with the J 21 piston-propelled engine version – was the risk for the pilot to hit the blades when bailing out, as the engine was placed right behind the cockpit. The solution came with one of the first ejection seats in the world, developed by Saab in 1943, being tested on the ground and on-flight and being a SAAB B 17 the testing platform. Another drawback was that, similar as the earlier versions of the Mustang P 51, the rearward view was rather poor, which could be problematic in a dog-fight. The J 21 featured a characteristic wing, as it was roughly strait from the main fuselage to the tail twin-booms, then being slightly swept back from the tail booms to the wingtips. The wing was purposed with acquiring laminar flow as far as possible. In regards to the aerodynamics, it was required the airframe to reduce minimum drag and engine cooling drag, so the oil and liquid coolers, along with the duct system for the engine, inside the airfoil contour between the fuselage and the tail booms. Considering the tail boom design, the horizontal elevator was placed between the tail sections, connecting them. The landing gear, meanwhile, was of tricycle configuration and long, which made the J 21 to be a tall aircraft so to keep the propeller away from the ground. The rear gear retracted into the tail booms behind the rear wing spar, but this forced the fuel tank to be placed in the wing centre section. The frontal wheel was located at the nose. The engine was a Daimler-Benz DB 605B inverted V12 of 1475 hp, which gave the airplane speeds of maximum 645 km/h (400,78 mph), but as the engines were received in poor conditions, improvements and overhauling were required. As a result of the power provided by this engine and the aerodynamic characteristics, the J 21 was deemed good, as it had excellent handling, benign stall characteristics and tight turning circle. The armament also gave this fighter good firing power, with the Swedish pilots being able to compare it with the Mustang P 51D (Sweden received a good number of them) and considering they were a good match for it. But the main drawbacks were that at medium and high altitudes performance tended to decrease, the rearward view was poor, and the controls were heavy to operate, increasing tiring during combat. The armament of the J 21 consisted of a 20 mm cannon, either a Bofors or a Hispano-Suiza HS.404, and 2X 13,2mm Bofors machineguns at the nose, with 2X 13,2mm Bofors machineguns in the wings. The J 21A-3 was able of carrying unguided rockets (2X 180mm or 8X 80/145mm) and bombs (600kg, 500kg, 250kg or 4X 50Kg). After World War II, the jet engine technology was becoming the mainstream propulsion system, and the Flygvapnet wanted to catch up and incorporate such technology into its assets. As the development of a new jet propelled fighter would take some time, the J 21 was chosen to be the platform for using an airframe in use with the new technologies back then. As a result, the J 21R was developed and introduced, with the first prototype taking flight in 1947 and then entering service in 1950. This ‘new’ fighter required some structural changes so to cope with the new power plant, like up to 50% of its airframe. First, the main body was slightly prolonged ant widened, so to allow the De Havilland Goblin 2/Flygmotor RM1 engine (that allowed speeds of 800 km/h) and the air intakes, located at each side of the fuselage. In addition, the stabilizer was moved upwards top to the fin, so to allow the engine flow, requiring the tails to be redesigned. The wing leading edge was mover forward and made sharper. Airbrakes were introduced, one upward and other downward flaps placed on the outer wing’s trailing edge. Given the increased speed, the ejection seats were properly modified so to enable ejections at subsonic speeds. And as the propeller was removed, the landing gear was shortened in turn, reducing the height of the airplane. Fuel tanks were fitted in the middle wing and the wingtips, which increased the fuel volume. The J 21R received an enhanced firing power, as the standard 20mm cannon/4X 13,2mm M/39A heavy machineguns set was added with a centreline external pod carrying 8 additional 13,2mm M/39 heavy machineguns. In addition, the J 21R was fitted with wing racks allowing the airplane to carry 10X 100mm or 5X 180 Bofors rockets, or 10X 80mm anti-armour rockets. The J 21 is, like the J 29 Tunnan, the product of Sweden’s concerns about its own security during WWII, especially in the light of Germany’s invasions of Norway and Denmark in 1940, which were neutral nations by the time. As Sweden considered that its existing air assets wouldn’t be able to successfully contribute to the defence, given their obsolete condition, it considered that new aircraft were necessary. As with the J 29, Sweden faced some problems when trying to acquire some technology due to the restrictions imposed by the conflict, although by sheer luck it was able to receive the Daimler-Benz DB 605B engine, as Germany was trying to hamper the delivery. These circumstances decided the Swedish government to undertake a local rearmament programme and implement a policy of ‘armed neutrality’ to secure the nation’s neutrality. The focus was placed on the development and fabrication of advanced aircraft. As the same concerns prevailed after World War II and into the very earlier days of the Cold War, it was deemed that the resulting technologies from the War needed to be exploited and incorporated, having in mind Sweden to catch up with the newly developed technologies, especially in regards of propulsion. The Saab J 21 became the platform for the Flygvapnet to make the transition from piston-propeller engine to jet engine, while at the same time providing the country with a locally built jet engine fighter, while newer and more advanced aircraft were put into service. The fact that the J 21 was used as a basis for an almost new jet powered engine fighter is a product of Sweden’s innovative thinking and also of its capacities – out of need, in part – of working with existing resources at the point of maximizing them. While the J 29 Tunnan has the honour of being the first jet fighter exclusively built for that purpose, it is the J 21 the very first jet engine fighter the Flygvapnet operated with, being amongst the very few designs, if not the only one, in being successfully modified as it received two different types of power plants. And while the J 29 Tunnan displaced the J 21 as a fighter, it was able to operate as a good ground attack aircraft until 1956, making this airplane born in the World War II, an early Cold Warrior and the basis for Sweden’s jet fighter industry and operationalization. It simply meant a huge step for the Swedish Air Industry, let alone its Air Force. J 21A-1 – Fighter version and the very first production series of the J 21. It featured the armament configuration of the 20mm Hispano-Suiza HS.404 cannon and the 13,2mm Bofors/Colt heavy machine guns. In service until 1949. 54 delivered. J 21A-2 – Fighter version and the second and third production series, featuring enhanced avionics and incorporating a Bofors 20mm gun, with the other armament being the same. It was also equipped with further direction horizon instruments. In service until 1953-1954. 124 delivered. J/A 21A-3 – Fighter/fighter-bomber version based from modified J 21A-2 airframes. It was equipped with a SAAB BT9 bomb aiming sight and two RATO (Rocket-Assisted Take-off) devices, armed with unguided rockets (2X 180mm or 8X 80/145mm) and bombs (600kg, 500kg, 250kg or 4X 50Kg). 119 delivered. J 21RA / A 21RA – First production series powered by a De Havilland Goblin engine. Later reconfigured into ground attack airplanes (A 21RA). Fitted with wingtip fuel tanks to increase the operational range and endurance. Operated until 1953. 30 delivered. J 21RB / A 21RB – Second production series powered by a Swedish-license made De Havilland Goblin (RM1). It was also reconfigured later into a ground attack airplane (A 21RB), with the nose heavy machineguns changed to a 12.7mm caliber. Fitted with wingtip fuel tanks to increase the operational range and endurance. Operated until 1956. 30 delivered. Sweden -The Flygvapnet operated the J21 a time roughly after the end of World War II. It operated with 54 fighters of the J 21A-1 version, 124 The J 21 fighters of the J 21A-2 version, and 119 fighter/bombers of the J 21A-3 version. The J 21 was in service between 1945 and 1954, with X units: F9 Goteborg, F15 Soderhamn, F12 Kalmar, F6 Karlsborg and F7 Såtenäs. In addition, the Flygvapnet operated with 30 fighters of the J 21RA version, and 30 fighters of the J 21RB version. Both were later on modified into ground attack airplanes, being denominated as a result A 21RA and A 21RB. The J 21R was in service from 1950 to 1956, with three units: The F10 Ängelholm, the F7 Såtenäs, and the F17 Kallinge. 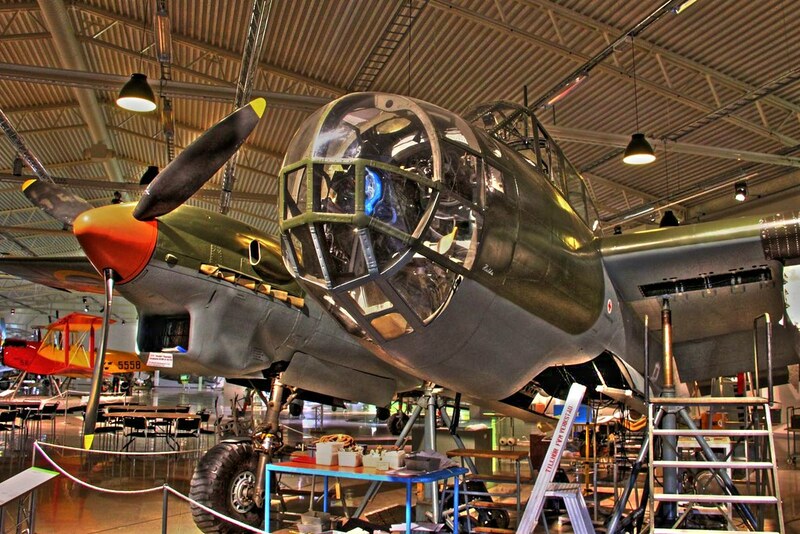 Three J 21 remain today as museum exhibitions in Sweden. 1 X 20 mm Hispano-Suiza HS.404 or a Bofors cannon located at the nose. 2 X 13,2 mm Bofors (Colt) heavy machine guns located at the nose. 2 X 13,2 mm Bofors (Colt) heavy machine guns located at the wings. 1 X 20 mm Bofors cannon located at the nose. 4 X 13,2 mm M/39 heavy machine guns located at the nose, later changed to 12.7mm caliber. 8 X 13,2 mm M/39 heavy machine guns on a centreline pod. Wing racks allowing 10X 100mm, 5X 180mm, or 10X 80mm anti-armour rockets. The Saab 29 Tunnan was a single-seat, single-engine transonic aircraft and first-generation jet fighter. It was a small aircraft with a single central air intake placed at the nose, a bubble cockpit and thin sweptback wings. It was the very first Western European design to have a swept wing layout of 25 degrees rearward, incorporating many of the latest technologies of the time. Saab obtained access to WWII German studies involving swept wings and their positive effects in regards to speed in Switzerland, and as a result, the J 29 Tunnan came to be similar to the German Luftwaffe’s Messerschmitt Me P1101 project. The development aimed initially at producing a fighter-interceptor, but reconnaissance and ground attack versions were also developed and produced, however a training version was not produced due to time constraints of the production schedule. Sweden was developing a strong air defence system that enabled it to take advantage of innovations introduced in WWII. As a result, by late 1945 the development of the Tunnan began, with the Swedish Royal University of Technology and the National Aeronautical Research Institute taking part by providing wind tunnel testing that defined the general aerodynamics of the Tunnan. Just like the Saab J32 Lansen, a single Saab Safir was modified, fitting swept wings to its airframe in order to test the design of the wings alone. Four prototypes were built during the development process, with the first two lacking any sort of weaponry carrying heavy testing equipment instead, and the third prototype carrying four 20mm Hispano Mark V cannons. These prototypes tested different aerodynamic features, such as the location of the airbrakes – either in the fuselage or on the wings, as well as the configuration of the ailerons and flaps. The prototypes also hinted that the Tunnan design would be able to reach and even exceed the maximum Mach they were designed for. Once in service the Tunnan broke many records. It set a world speed record on a 500 km closed circuit as it reached a speed of 977 km/h in 1954. The reconnaissance version set also a record of 900.6 km/h in a closed circuit of 1000 km. In 1948, the J 29 Tunnan flew for the first time, in service with the Flygvapnet from 1951 until 1976, with 662 fighters built from 1950 to 1956 making the Tunnan the most numerous aircraft produced Saab, as well as the longest lived design in service. It also served with the Austrian Air Force with 30 units in service until 1973. A single J 29F still can be seen flying at airshows around Europe. The Tunnan is a thin 25 degrees swept back laminar-flow mid-wing fighter, having a single tail and a single engine, featuring the design similar to most of the first generation jet fighters: a single engine with a central straight-through airflow system that maximized thrust. Two tubular pitot sensors were located at the wing tips. For lateral stability during take-off and landing, automatic-locking leading edge slots were fitted in the wings and were also interconnected with the flaps. It was later on enhanced with the installation of an afterburner and of dog-tooth leading edge in the wings – which increased the Mach speed the Tunnan could attain. Trim tabs and dive brakes were also incorporated to the design, being initially placed on the wings and later re-located to the fuselage, directly forward of the main landing doors. The Tunnan also featured a bubble shaped canopy with the cockpit located right above the engine air intake, and forward the wing’s leading edge. The canopy was opened by sliding backwards, allowing the pilot to access and exit. The design also took advantage of the already existing ejector seat developed in 1943 by Saab, complemented by an explosive jettison system to remove the canopy in case of ejection. The landing gear was of tricycle configuration, with the rear wheels retracting into the fuselage, which contributed in making the wings thin, and a single wheel gear at the nose. The vertical stabilizer had a tapered edge, being straight trailing edge with a blunt tip, with the tail section placed above and behind the engine exhaust nozzle. In turn, the horizontal stabilizer is mounted practically at the base of the tail. The Tunnan proved to be not only a very capable and agile fighter, but also proved very durable in sorties. During a UN mission in the Congo it received intensive ground fire without sustaining any noticeable damage. The engine, along with its aerodynamic characteristics, made of the Tunnan a fast fighter. The powerplant consisted of a DeHavilland Ghost turbojet engine producing 5000 lbs of thrust. This engine was deemed suitable for the fuselage of the Tunnan, replacing the originally planned DeHavilland Goblin, and had the advantage of making maintenance easy with the engine cowling able to be removed as a single piece. The armament of the Tunnan consisted of four 20mm Hispano Mark V cannons placed in pairs on both sides under the nose. The pylons were capable of carrying 75mm air-to-air rockets, 145mm anti-armour rockets, 150mm HE (High Explosive) rockets and/or 180mm HE anti-ship rockets. Later versions were capable of using Rb24/AIM-9 Sidewinder air-to-air missiles. Fuel air-drop tanks could be used as napalm bombs. The Tunnan is the product of Swedish concerns about its security during World War II, in the face of Germany’s rapid annexations of both Norway and Denmark and acknowledging the country was unable to resist such aggression. But there were also of concerns that Sweden was falling behind after the rapid development of technologies and innovations brought about during the war. Sweden’s isolation in this aspect was exacerbated by the degree of defense secrecy by both the Axis and Allied countries. As a result, an effort was made in order to strengthen defensive capabilities with the focus being placed on the development of modern aircraft to bolster air defence, exploiting the war-time innovations in power – namely the recently introduced jet propulsion technologies as well as other advances in aircraft design. The new technologies were exploited after Sweden obtained access to research after the war. The already existing Saab J 21R was utilized to make the transition between the piston and jet propelling engines and to provide a temporary solution, but it was deemed necessary to develop a much more modern aircraft in order to keep the air defences fit. The Tunnan became the solution, making the Swedish Air Force the 4th largest during the mid-century. All the aircraft produced by Saab and in service with the Flygvapnet from 1948 to 1989 saw relatively little combat. The Tunnan constitutes the only exception, as it saw extensive use during conflict in Central Africa. As the crisis in the Congo unfolded in 1961, Sweden contributed five J29B Tunnans that were tasked with protecting UN’s air transport and providing fire support to cover UN ground troops when needed, constituting the F22 unit. In 1962, four additional J29Bs and two J29Cs were sent. The 11 Tunnans provided by Sweden to the UN mission comprised the only air component of the UN at the time. As the crisis evolved and the additional six Tunnan were required, air superiority was achieved along with ground attack missions that involved the utilization of the fighter’s 4 Hispano cannons and rockets. The missions mainly focused attacks on military trains and airfields at Katanga, as other aerial assets from Ethiopia – F 86 Sabres – and India – Canberra light bombers – withdrew. When the UN peacekeeping mission was over in 1963, four of the Tunnans returned to Sweden, while the remaining met an ignominious ending, destroyed at the base, as it was deemed prohibitively expensive to return them. J 29 – Four prototypes built in 1948-1950, for the development process only. J 29A – Fighter version. Armed with four 20mm Hispano Mark V cannons, and 12 75mm anti-armor rockets. Later series relocated the wing-mounted dive brakes into the fuselage. Remained in service until 1965. 224 delivered. J/A 29B – Fighter/attacker version. It featured an increased 50% fuel capacity and wing hardpoints with provisions to carry bombs, rockets – 8 or 14 80mm or 145mm anti-armour; 8 or 14 150mm HE; 2 or 4 180mm anti-ship – and fuel drop-tanks that could be used as napalm bombs. Served until 1965. 332 delivered. J 29C – Reconnaissance version for day and night operations. It carried between 5-6 cameras in a modified nose, being unarmed cameras replaced the 4 guns. It received the same wing enhancement of the J 29E. It also became the first jet-powered photographic-reconnaissance aircraft introduced by a non-aligned nation, as well as the first Swedish aircraft to be equipped with radar warning receivers. An antenna for backwards-looking radar was placed at the tail cone, being afterwards relocated This version set a new speed record back in 1955, reaching speeds 900.6 km/h (559.6 mph) in a closed circuit of 1000 kms (621.4 miles). 76 delivered. J 29D – A single unit to test the DeHavilland Ghost RM2 turbojet fitted with an afterburning thrust, later upgraded to J 29F. J 29E – Fighter version, which incorporated an enhanced wing design by fitting leading edge dogtooth, aimed at increasing critical Mach number. It also increased load factor. Same armament configuration as the J 29B. Upgraded to the J 29F version. 29 delivered. J 29F – Fighter version, which were modified J 29B and J 29E airframes. This version featured the enhanced wing design of the J 29E, and the DeHavilland Ghost engine equipped with an afterburner. This version was also optimized to carry two Saab Rb24 (AIM-9 Sidewinder) missiles in 1963, having the same armament payload of the J 29B. It also performed in the role of aggressors, and performed target towing. Most were retired by 1967. 308 converted aircraft. SK 29 – Planned training version. It could have featured a two-seated cockpit, with seats placed side-by-side, no armament and limited fuel capacity. Cancelled. J 29R – All-weather fighter version equipped with an air intercept radar. Cancelled. Sweden – The Flygvapnet operated the Tunnan from 1951 to 1967, having 665 units operating, all of the J 29A, J/A 28B, J 29C, J 29E and J 29F versions. Some were kept for countermeasures trainers and target towing duties until 1976. 11 J 29Bs and J 29Cs took part in the United Nations Operation in the Congo (ONUC), being the only Tunnan, and actually the only aircraft during the Cold War of the Swedish Air Force to take part in combat operations abroad. Austria – The Österreichische Luftstreitkräfte (Austrian Air Force) operated 15 restored J 29Fs by Saab in 1961, where they formed the first Jagdbomber Staffel. An additional 15 restored J 29Fs were sold to Austria, where the two guns on the port side could be replaced by three cameras, which were moveable during flight forming the second Jagdbomber Staffel in the Austrian Air Force. These remained in service until 1972. 80mm or 145mm anti-armour rockets, 150mm HE rockets, and/or 180mm HE anti-ship rockets. 4 X SKa 10 cameras, 1 X SKa 15 camera for mapping, and 1 X SKa 5. 2 X fuel drop tanks that could be used as napalm bombs. A tandem two-seat, single-engine transonic aircraft. Intended initially as an attack aircraft, it was later developed into fighter, reconnaissance, and ECM versions thanks to the aircraft’s size, which allowed the development of the aforementioned variants. The aircraft also had low swept back wings and similar elevators located on the tail. Developed in order to replace the WWII-era light bombers, attack and reconnaissance Saab B 18/S 18, the Saab J 21R/A 21R, and provide a ground-attack complement to the Saab J 29 Tunnan. It was also developed after Flygvapnet requested an aircraft capable of attacking anywhere along Swedish long coastline within one hour after taking off from a central location, and to be capable of operating in any weather conditions, and in both day and night. Lansen development began by 1946 with the project P1150, where a configuration of two engines was at first considered but latter scrapped given many accidents with foreign aircraft having such display. A Saab 91 Safir, a piston/propeller engine training light aircraft was modified by incorporating the swept back wings intended for the Lansen, in order to test the design. Its first flight took place in 1952, being a very advanced concept in both design and configuration, as it was an aircraft with the best design and quality in comparison to any other European design of the times. In fact, it is among the first designs in incorporating a radar. Another interesting fact is that the Lansen was the first aircraft to be designed upon a mathematical coordinate system, instead of blue prints. It also broke the sound barrier in 1953, as it exceeded Mach 1 while performing a shallow dive. In 1956 it entered in service with the Flygvapnet. 452 aircraft were built between 1954 and 1960, remaining in service until 1997, although three Lansen with experimental, research and test and trial tasks were still operating as of 2012. The Lansen is designed as a swept back low-wing fighter, with a single tail and a single engine, a Volvo Svenska Flygmotor RM6A, enabling a maximum speed of 1123 km/h. The Lansen was among the first aircraft to be built specifically for attack missions. Its airframe was a sleek, streamlined and clean design, in which every line was calculated using a mathematical early computer-based design. It could sustain +12g and -8g. Its low wings had a 35° sweep and a composition of up to a 10° laminar profile, having hydraulically-boosted ailerons. One-section stall fences were installed on the wings, a pitot tube on the right wing and three hardpoints. The landing gear was of tricycle configuration. The engine was originally intended to be the Swedish STAL Dovern RM4, but as it was not ready by the time the prototypes were completed. The Svenska Flygmotor RM6A, a Swedish version of the Rolls-Royce Avon, was the used in the Lansen. The afterburner was of Swedish design. The air intakes for the engine were located at both sides of the fuselage, forward of the wing root and cockpit. The Lansen is among those first designs implementing onboard radar. The radar array was a PS-431/A based on the French design that worked in coordination with the anti-ship Rb04C missile, one of the first “fire and forget” missiles. As not all the squadrons were equipped with radar, and usually only one aircraft of the group would carry a navigator, the Lansen equipped with both radar and a navigator would be the leader of the group guiding the other aircraft to the target. The radar would work in tandem with a Saab S6 computerized fire-control system, a Hughes AN/AAR-4 infrared search & trach (IRST) sensor, with the radar gunsight indicating to the pilot when there would be an optimal firing solution (these systems were mostly equipped in the J32B). The S32C was equipped with a radar warning receiver, and the J 32E was equipped with jamming devices instead of the radar in the nose. All aircraft were equipped with Saab ejection seats for the crew. The Lansen would carry a varied array of weaponry depending on mission and version. The basic weapons were 4 X 20 mm Bofors (or Aden M/55 30 mm) guns located at the nose, 2 Saab 304/Rb 04 anti-ship missiles or 12 or 24 unguided rockets (60, 63, 75, 135, 145 and 180 mm), and up to 12 iron-bombs (15, 50, 80, 120, 250, 500, 600 kg). it could also carry 4 Rb 24 AIM Sidewinder missiles, ECM pods, target towing pods, jamming equipment, cameras, and chaff dispensers. The Lansen was a large airframe providing a versatile platform to carry a variety of different arms depending up on mission. Along with the Saab AJ 37 Viggen, the Lansen was a contender to carry nuclear weapons as a deterrent to protect the region, but ended up never being utilized in this role. It would have been interesting to see how a nuclear-armed version of the Lansen might have worked. But even if the Lansen in the end was not a nuclear warrior, it could boast of having a very advanced capability thanks to its design process, which was the first to be designed using a computer. Furthermore, it is among the first post-war designs to have incorporated its own radar, in addition to being among the first operational swept back wing designs. A 32A – The ground attack and maritime strike version of the Lansen, and the basic one. Armed with four Bofors 20mm guns on the nose, with a special device to deflect the empty casing from entering the air intakes. The fuel tank nose was also protected with a neoprene cover to protect from the casings impact. The aircraft could also carry one of the first “fire and forget” missiles, the anti-ship Rb04/Saab 304 missile. It could also carry bombs and rockets of varied calibres and payload. This version was intended to carry the nuclear weapons developed by Sweden, should it nuclear programme was not cancelled by the 60’s. Remained in service until 1978. 287 delivered. J 32B – All-weather fighter version, mainly used in adverse climate conditions and at night. Armed with four 30mm Aden cannons with the casing being retained, sparing the protective measure implemented on the J 32A. 4 Air to air Rb24/ AIM 9 Sidewinder missiles and 75 m/57 mm rockets were also part of this version’s armament, all being fired by radar sighting. There was a radar display for the pilot and not exclusively for the navigator, allowing targeting without visual thanks to the fitted IR sensor (AN/AAR-4) on the wing. Remained in service until 1973. 118 delivered. S 32C – Maritime surveillance and photo reconnaissance version. Fitted with a PS-432/A radar with longer instrumented range, and four cameras (SKa 17 and SKa 18), latter, SKa 23, SKa 15 and Jugner FL S2 cameras were fitted. All the cameras were for low, high and night takes. Twelve additional British 75 kg photo flash bombs were also used, mainly on the wings. Chaff dispensers and RWR gear – to give visual and aerial warning – were installed. In service until 1978. 44-45 delivered. J 32D – Target towing version modified from six J 32B airframes. Remained in service until 1997. 6 delivered. J 32E – ECM version from modified 15 J 32B. Also tasked with ECM warfare and ECM training. The radar was replaced by a G24 radar-jamming device against ship and land-based radars, and two chaff dispenser were incorporated. It also carried 120kg dummy bombs. Remained in service until 1997. 15 delivered. J 32AD – A proposed daytime fighter version purposed to replace the J29 Tunnan. It would have been a single seat fighter with four 20 mm guns and a fifth 30 mm gun, all located on the nose. It would have been armed also with rockets and missile but lacking a radar. Never developed and instead 120 Hawker Hunters entered in service, filling the gap between the J 29 Tunnan and the J 35 Draken. J 32U – Another proposed fighter version with enhanced performance than the J 32B, with a Rolls-Royce RA 19R engine, a supplementary rocket engine, a thinner wing with 40° of sweepback, and a flying tail. Political decisions and considerations of replacing the Lansen with other types of aircraft after 8 years of service prevented this development to see the light. Sweden – The Flygvapnet was the only operator of the Lansen, having this aircraft in service from 1956 to 1997. 118 airframes where of the J 32A version; 118 airframes where of the J 32B version – 6 were modified to the J 32D and other 15 were modified to the J 32E versions – and 44-45 airframes where of the S 32C version. 452 J 32 Lansen served in total with the Flygvapnet until 1997. Three Lansen remained in service by 2012 with experimental and research purposes. 4 X 20 mm Bofors or Aden0 M/55 30 mm guns located at the nose. 2 Saab 304/Rb 04 anti-ship missiles. 12 or 24 unguided rockets (60, 63, 75, 135, 145 and 180 mm). Up to 12 iron-bombs (15, 50, 80, 120, 250, 500, 600 kg). It could have also carried nuclear bombs, in case Sweden would have continued its nuclear programme. 4 Rb 24 AIM Sidewinder missiles. One of many still airworthy Lansens enjoying retirement at an airshow.